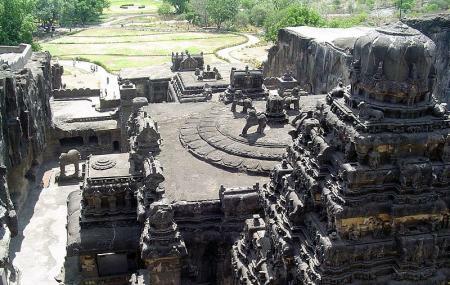 The Ellora Caves in Maharashtra are the finest examples of rock cut architecture in India. It is a World Heritage Site as designated by the UNESCO. These caves are known for Hindu, Buddhist and Jain cave temples. These were built during the 6th and the 9th centuries during the rule of the Kalachri, Chalukya and the Rashtrakula dynasties. It is a collection of 34 caves cut out from the straight face of the Charanadri Hills. The Buddhist caves here include large halls and various rooms that were earlier used for the purposes of dining, sleeping and cooking. There are many carvings of Lord Buddha and the Jatakas and also of many Buddhist saints. The Hindu Caves were constructed mostly during the reign of the Kalachuri dynasty. A few caves were also built in the reign of the Rashtrakula dynasty. All of the caves are so different from each other but equally beautiful. The most important Hindu cave is known as the Kailasnath Cave. This was designed as a dedication to Lord Shiva’s abode in the Kailash Mountains. The five Jain caves in the Caves all belong to the Digambara sect and were built strictly maintaining the authenticity of the Jain culture. These caves are not as large as the other caves but outshine all others in the aspect of art and designs. The other important caves are- The Dashavatara, Rameshwara, Dhumar Lena, Ravan ki Khai, Nilkantha, Kumbharvada, Gopilena, Chota Kailash and the Jagannath Sabha. Photography is allowed free of any extra charge. Rs 10 per person (for Indians and citizens of SAARC and BIMSTEC countries). Actual hours are from sunrise to sunset each day. Take a taxi or a state bus to Ellora from Aurangabad. Its about a 2 hour drive. How popular is Ellora Caves? People normally club together Tomb Of Aurangzeb and Grishneshwar Jyotirlinga Temple while planning their visit to Ellora Caves. Huge area of caves of ancient temples of different religions. Can take at least 5 to 6 hours or longer to go inside every cave. Cave #16 is biggest and very worth seeing, it is located near the main entrance. Takes about 1 hour to go through inside entire cave, it is huge, carved out the inside of a mountain or hill which is actually a huge rock. The other caves are smaller and simpler, some are much older than cave 16. Before the park entrance there are food stalls, best to get bottled water and some snack foods before go into the park, you may spend 5 to 6 hours in the park. Prepare to spend at least 2 hours just to see cave 16 and a few caves next to it. 600 Rs park entrance fee for most foreign tourists, no more fee for each cave. Monkeys hanging around the park exit waiting for people to feed them foods. Sellers of peanuts and banana can be found near the exit, 10 Rs for small handful of peanuts, 20 Rs for a few bananas. Best go there not on weekend or India public holiday due to too many visitors. Wear shorts on hot day and wear comfortable shoes, many stone stairs to climb. Photos are allowed. Good place to visit. Need to spend one day for completing the caves. Nice place to visit excellent works of Art. How they have done the curving at the earlier times. Really excellent work to see. Ellora caves don't need introduction. Our history books helped us there. We had a wonderful time exploring various caves. I'm not saying anything that can be googled and found. So Ellora requires minimum 3 hours. And it's really worth every minute of it. You can walk and see all caves from 16 to 10. For Jain caves you need to catch a shuttle, which starts from the front of cafe 16. Jain caves 32-34 are around 1 km away. Last shuttle is at 5:40 range so plan accordingly. Caves-16. 10. 12. 21. 29. 30- 34 are the ones you shouldn't miss. It is a miraculous architecture. Its around one hour journey from Aurangabad. Buses are easily available. Morning 9 inwards one govt. hotel also there for food inside. Better avoid summer season to visit there. Its very hot area..